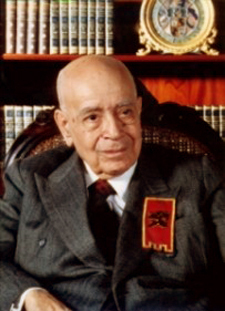 On August 20, 1980, the late Bishop Antonio de Castro Mayer gave a talk in São Paulo, Brazil, to an auditorium of TFP members about his position on the New Mass and Council Vatican II. Mr. Atila Guimarães, as secretary of studies of Prof. Plinio Corrêa de Oliveira, kept the transcript of that talk. He selected some parts of a question-and-answer conversation with Prof Plinio at the end of that talk and translated them to English here for the benefit of TIA readers. Bishop Mayer - This matter of saying that one should accept the Council interpreted in the light of Tradition is difficult to justify. For if the Council has nothing wrong, then we should interpret it according to Tradition; if, however, it has something wrong, then we cannot accept it at the light of tradition. No one can say that the black is white in the light of Tradition. This is unacceptable. It is not a serious interpretation. Prof. Plinio - What are the unacceptable points of the Council, Your Excellency? There are also texts in the Council that allow for two interpretations. Depending on the persons reading them, they can be understood in different ways. On a visit to Campos, Mr. [Jean] Madiran said this to me about those points: “Some texts permit an orthodox interpretation, but the first interpretation that comes directly from the reading is heterodox.” That is, it is possible to apply an orthodox interpretation to them, but the immediate first interpretation is not orthodox. Prof. Plinio - When these heterodox interpretations comprise a system of thinking, they point to a suspicion of heresy, don’t they? Bishop Mayer - Yes, there is no doubt about that. The Council was written with great care to avoid such a suspicion, but actually that is what happened. Further, there is the general principle that when the Church teaches, she cannot use ambiguous words. Her teaching is to clarify and illuminate minds; she cannot teach [ambiguous] theses that obscure minds. 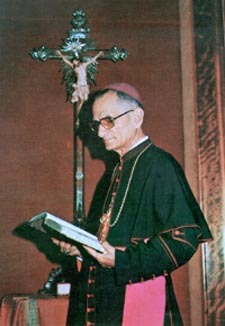 Dr. GVL - I agree with the arguments of Your Excellency against the Council, but I see that at least 90% of the Bishops have accepted it; in effect only Your Excellency and Archbishop Lefebvre do not. 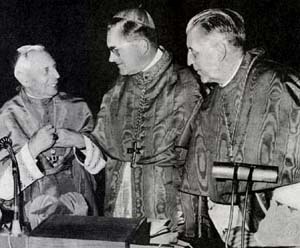 Paul VI and John Paul II also accepted it. How can one explain, from the theological point of view, the promise of Our Lord [that the gates of Hell will not prevail against the Church]? Bishop Mayer - Here you need to distinguish what is the Church. The Church is not just the Hierarchy. She is the ensemble of the faithful directed and oriented by the Hierarchy. The general interpretation of the Council by the Hierarchy did not enter the obligatory teaching of the Church. That is, those Prelates are not imposing their interpretations as indisputable truths of faith. For this reason, we cannot say that there is an error being imposed as the general doctrine of the Church that has to be accepted by all. This is how the infallibility of the Church is saved. You could still say: “But [practically speaking] the Church would have failed in her mission of defending, conserving and spreading the Faith.” Here, we must take into consideration the attitude of the faithful. There are numerous faithful who go to the New Mass etc. but continue to live as true Catholics. Some complain about it; others go only to receive the Holy Eucharist disregarding what other things are going on. Therefore, we cannot say that on the part of the faithful there has been a conscious adhesion to the error. For this reason, the infallibility of the Church ends by being saved. This is not to say that there is not a profound crisis in the Church. It constitutes a constant temptation for all the faithful [to lose the faith]. It is good to point out to those here [in the auditorium] who are accustomed to the language and implications of civil law, that when a person is suspected of a crime in civil law, he is supposed innocent until proven guilty. Thus, even when he is suspected of a crime, he is to be treated as innocent. This is not the case with the suspicion of heresy in Canon Law. To be suspected of heresy is a crime in itself. Therefore, when such a situation presents itself, when an individual author writes ambiguous things representing an erroneous system of thinking, he objectively acts wrongly and commits a crime. It is not licit for him to do this. Applying this to the Council, we cannot go so far as to say: “The Council has these many ambiguities, therefore it is heretical.” But we can say: “It is in an irregular situation according to Canon Law.” It seems that the Council’s systematic ambiguity goes against the teaching mission of the Church. Bishop Mayer - If the study of the Council would prove that a systematic ambiguity was used always toward the same end, a suspicion [of heresy] could be held over the authors of the Council. For this suspicion to constitute a crime, it should be confirmed by the authors. If they do not confirm the suspicion, they are not subject to the canonical punishment. Prof. Plinio - Do they incur crime, but are not subject to penalty? Bishop Mayer - According to the Canon Law when they incur crime, the penalty applies. If they are not subject to the penalty it is because they did not incur crime. Prof. Plinio - I understand. You are right. Bishop Mayer - Absolutely speaking, unless a clear charge is made against a person, he is exempt from punishment. He may be subject to an inquiry regarding the orthodoxy of his thinking. But he will still have the chance to publicly defend himself and say that he understood this or that thesis in such and such way [that is not against the Faith]. Prof. Plinio - I wonder whether for the good of the Church the solution for this situation would be for a group of Bishops and the faithful who see an ensemble of systematic ambiguities in the Council documents to take a public position exposing their perplexity and asking for an explanation. I am not sure to whom this should be directed - John Paul II, the ensemble of the conciliar fathers, the Council itself - I don’t know. Bishop Mayer - I don’t know either. Perhaps one could direct it straight to the Pope and to the commission in charge of interpreting the Council. Prof. Plinio – It could be something like that. 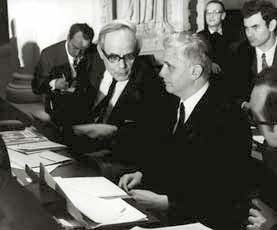 It would be a very difficult work that would have the merit, however, of re-establishing the unity among all [Catholics], as long as the Council or John Paul II or this commission would deign to answer us. Should they not respond, the matter would be suspended awaiting the answer. It seems to me a humble, respectful and loyal position. Bishop Mayer - This would be something like the position of the Abbé de Nantes. He wrote an accusatory piece declaring that Paul VI had fallen into heresy, and he sent this statement to Paul VI himself. Prof. Plinio – My suggestion would be something different: making a question and a request. Giving that ambiguity exists [in the conciliar texts], a considerable number of persons have certain doubts. We respectfully ask for an explanation. It seems to me that this would be a more efficient position to take and more coercive than that [of the Abbé de Nantes]. It would have the advantage of uniting all those who are anti-conciliar. No matter what divisions exist among them, this would open the possibility of making a common platform, a common field of perplexities that would unite them. I leave this for Your Excellency to study at the opportune moment.